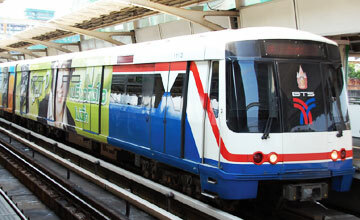 Why book Bangkok Don Muang Airport car rental at VIP Cars? Rent a car at Bangkok Don Muang Airport with pricing inclusive of CDW, Theft Waiver, Unlimited Mileage etc. 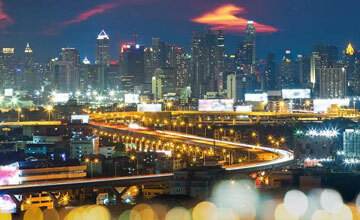 Rent a car for Don Mueang Intl Airport (DMK) – formerly known as Don Muang Airport – from VIPCars.com and explore the city of Bangkok in absolute freedom, on your own schedule. Finding a suitable rental car online asks for ample so that one can research and compare deals from different websites. But, this is not the case with us! With VIP Cars you can go from searching to booking within minutes! On our smart booking engine, you can search and compare prices from all the top suppliers at one place at cheapest possible rates, without any compromises on quality. Book your car hire for Don Mueang Airport today for our special rates and save more!! This list is not final; it can change with time as per the availability on the suppliers' end. 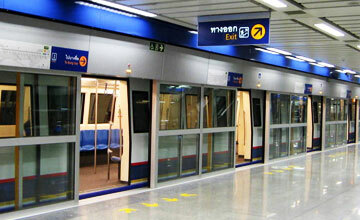 Previously known as Bangkok Airport, Don Muang Airport serves the Thai city of Bangkok and is located approximately 30 kilometers from the city’s center. There are two International airports which serve Bangkok; one is DMK Airport while the other is Suvarnabhumi Airport (BKK). 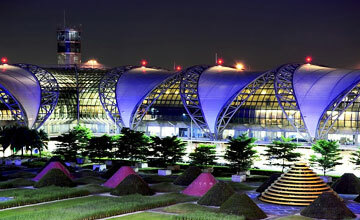 Before the construction of Suvarnabhumi Airport, IATA Code BKK was used by Don Muang, but after its opening, Don Muang Airport’s name was changed to Don Mueang and its IATA code was changed from BKK to DMK. Operated by Airports of Thailand, Don Mueang Airport is the 14th busiest airport in the world and act as hub for carriers like Nok Air, Thai Air Asia, Thai Lion Air, and Orient Thai Airlines. In existence since 1911, the airport was closed down in 2006, but was revived in 2007. Since 2012 it has been recognized for its low-cost flights. Don Mueang Airport has various car rental desks by global companies. Out of them Budget – VIP Cars’ partner –has a counter at DMK Airport while others like National, Hertz, Europcar and Thai rent a car offer 'meet and greet service’. Location: The car rental desks are located on 1st floors of both T1 & T2 terminals, after the passenger’s arrivals’ exit areas, hence are accessible to both International and domestic passengers. The authority, AOT offers free Wifi service at Don Mueang Airport through TrueMove H which passengers can access anywhere within the airport. For accessing the Wifi, the travelers need to register. How to Access? Just enable the Wireless connection on your device and select '@AirportTrueFreeWiFi’ from the existing connections. After that, open the browser, the login page will appear; input the asked information, select the language and you are good to go! Location: Both banks are located on the ground floor on the North side of the airport, just outside the terminal buildings, near the medical clinic center. DMK Airport has the following Duty-free shops which are located on the International Departure, Floor 3. Here are a few things that you can do to kill your layover or stopover time in Bangkok Don Mueang Airport. Short Layover? What to do in Don Muang Airport? For those passengers whose layover is really small and it is not possible for them to leave the airport, don't worry, there are numerous things that they can do at Don Mueang Airport to keep themselves busy. It is one of the most unusual golf courses in Thailand; it is an 18-hole golf course and to one's shock is located between the airport's two runways. It is not separated from the runaways by any means and the people are held at bay through a red light when the flight arrives. We are providing you with a few must-not-miss attractions that you can cover during your layover, & we advise you to rent a car as the presence of a vehicle at your disposal will allow you to move about at your will. 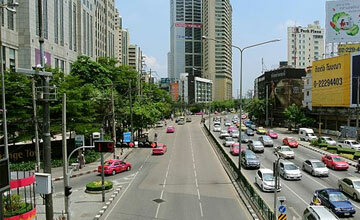 So, do pick a car rental from Don Muang Airport and make your trip from the airport easy and less time-consuming. Keep in mind that you will have to return to the airport at least 2 hours before your flight, so plan accordingly! Passage to Thailand’s central, northeastern and northern areas, Future Park Rangsit is one of the biggest malls in the whole of Asia. The mall houses 12 departmental stores, 1 supercenter, 300 fashion outlets, about 70 restaurants, 12 major banks, more than 126 mobile providers and a post office. If you are visiting in summers, and want to spend time indoors, this would prove a great way to spend your layover time. Officially known as Wat Phra Chetuphon Vimolmangklararm Rajwaramahaviharn, Wat Pho is one of the six main Thai temples which are classified as the royal temples of Thailand. Built by King Rama I, the temple known for its 46m long image of reclining Buddha, also houses a school of Thai medicine. Recognized by UNESCO, it is also known as the birthplace of Thai massage. Bangkok is home to numerous markets, but the one that stands out among the rest is Banglamphu market. Though it also offers what the other famous markets are offering – fresh produce, local goods, clothes, textiles, and various things that a backpacker would want – yet it outshines the others because of its cheap prices. 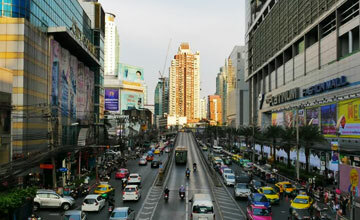 The prices are said to be the lowest in Thailand, even lower than the ones offered in the Phuket region. Built in 1782 by King Rama I, the royal palace, located in the heart of Bangkok, is just a small walk from the Temple of Reclining Buddha. Though it was the royal residence for long, it was deserted by the Royals in 1946 after the mysterious death of King Rama VIII. Made up of numerous individual structures, gardens, halls, and pavilions, the palace owes its unusual structure to the additions that were made by the various successors over the years.